The scarlet tanager is an American passerine. They breed through out the eastern half of the United States and parts of southeastern Canada. During this time they feed primarily on insects which they typically glean from th trunk and branches of trees at the top of the canopy. They will also catch flying insects in the air, like a flycatcher, and occasionally eat some fruit. 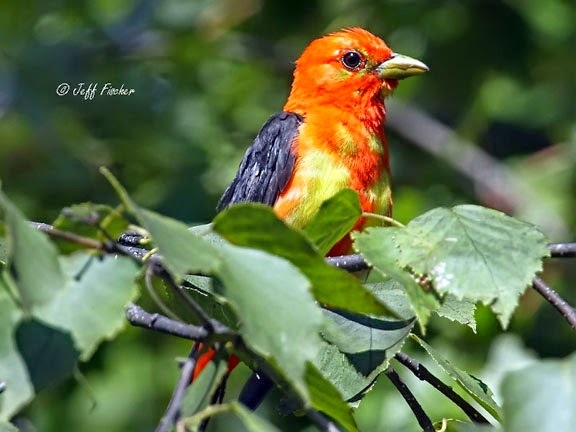 The scarlet tanager gets its name from the bright red color of the male. The females are yellow in color with the same black colored wings that the male has. In the fall males will molt and change from their bright scarlet colored plumage to a yellow color similar to the normal female plumage. The bird above was photographed in mid molt. 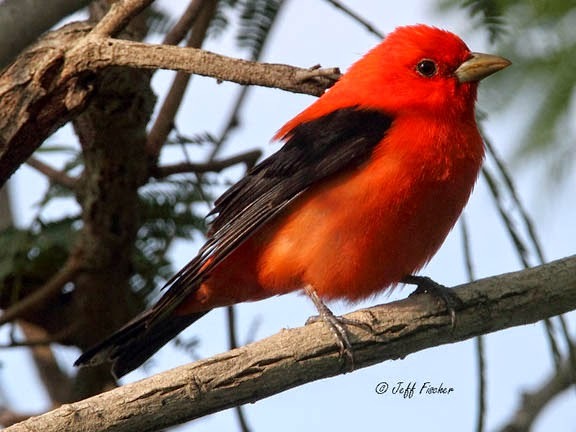 The tanagers will then migrate south, flying over the Gulf of Mexico to winter in Northern South America. Their they will join mixed feeding flocks of tanagers, flycatchers and other tropical birds. Beautiful photos, as usual. You are a master at snapping and showing birds along with good background info. Thank you!! I like the first one. nice and crisp. And I miss the warm weather they bring. A beautiful coloured bird. Thanks for info. The red in the first shot is so vibrant. Really great! Visiting you through ABC Wednesday today. What a beauty! 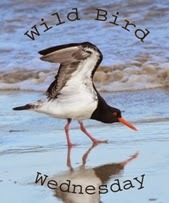 I've seen a few migrating birds but not this one, yet. Still looking up though ;) Great shots! Great pictures! Scarlet tanagers are beautiful birds! But I've never seen one before. What a bird that is. Beautiful both male and female! Also the hummingbirds below. One with a red breast and charcoal also a little green has been coming to our feeder - so shy! It's such a stunning bird! Great photos, and good info. scarlet, yet it looks orange! Lovely captures! Have a great week ahead!